Remember the days before remote locking? You actually had to unlock the front doors individually, but this meant that you did the gentlemanly thing of escorting your partner to the passenger door and with a great flourish, you unlocked it and ushered her into the vehicle. These days you push the button as you approach the car, it responds with a beep-beep and unlocks everything and your passenger gets herself into the vehicle, by herself. Having set the scene, it was 1987 and I had flown to the UK for a visit. Using the fact that I had been a ‘Works Driver’ in MG’s for British Leyland (before they pulled out of Australia) I had contacted MG Rover in the UK, looking for a car to test for the two weeks while I was there. No problem, I was told. They would supply a new Rover 825i for the duration of my trip (motor manufacturers in Thailand who expect full road tests after one drive around the block, please take note). 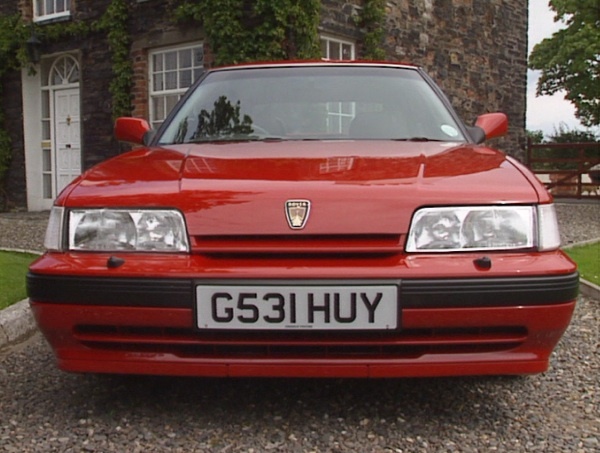 In 1987, this Rover 825i was the finest machine in the MG Rover stable. With mechanicals from the Honda Legend it had all the Japanese quality, with all the snob appeal of the ‘very British’ Rover badge, Westminster carpet on the floor and some polished English oak on the dashboard! It also came with remote locking, and the MG Rover chap showed me how it worked, and how the infra-red remote receiver was behind the internal rear vision mirror. The 825i proved itself to be a reliable, semi-luxury carriage; however, I found a problem I never expected. The remote locking failed! I had gone for lunch in one of those quaint English style pubs. You know the style – all dark wood and warm beer with crusty gentlemen smoking briar pipes and wearing caps and hairy tweed jackets with leather patches on the elbows. After lunch I ventured outside into the crisp, cold British air and strolled down towards the Rover 825i in the car park. As I walked towards it, I pushed the unlock button, but nothing happened. No flashing lights. Obviously I was too far away, so I walked closer and pushed the magic button again. Still nothing! By now I had arrived at the car and still no answer from the remote locking. I decided to go back to manual technology and inserted the key in the lock on the driver’s door. Nothing! It didn’t budge. I analyzed the situation, and it was then I remembered the MG Rover chappie telling me about the IR receiver behind the interior rear vision mirror. Looking through the windscreen I could even see it, a red bulb behind the mirror. I pointed the remote at the red bulb and expectantly pressed the button. Nothing! So I lay down on the bonnet of the car, so that I could get the remote on the windscreen, as close as possible to the red bulb receiver. With a determined thumb I pressed the button – and still nothing. Suddenly there was this very British voice saying, “I say old chap, just what do you think you are doing?” I turned round and there was the archetypal Briton, cap and tweed jacket, and bristling with anger. “I am trying to open my car, but the remote unlocking device does not work,” I replied. “That’s because this is not your car, this is my car,” said the crusty and now angry Brit. “No it’s not,” said I. “I have this silver Rover 825i on loan from MG Rover!” “I beg your pardon,” said crusty, angry gent, “this is MY silver Rover 825i that I bought from the agents here!” We were now standing toe to toe and I could see I would need the registration papers to prove my point – but the registration papers, were of course, inside the locked car. Next articleHave you met a nice mode lately?